I’ve calculated the word frequency in the subtitles of about 40k English movies. I thought I’d get something useful, but can’t see it yet. Listing highest ranking words proved almost entirely useless, so I excluded the most common stop-words. Here I listed the highest 500 ranking words. An interesting question here would be: is the relative frequency any different than the relative frequency in English language in general? 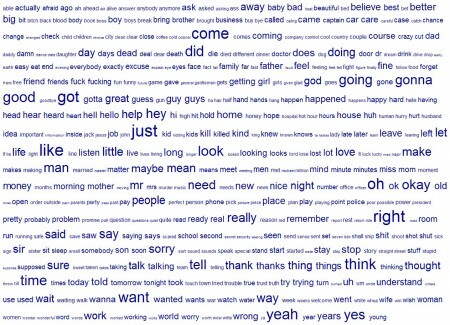 What words have higher frequency in movies than in everyday language? Can we detect movie speak by the lack of certain words? In fact it’s almost as good as watching the movie 🙂 . That’s why the next step will be listing the most common Yahoo-extracted terms for all the movies. Gotta do it while Yahoo’s still around 🙂 . pa za boljšo sliko bi blo treba zmergat hear/heard, thing/things ipd. prov maš.. stemming in lematizacija bi dost pomagala. sploh nism pomislu.